Family owned Dude Ranch in the Tucson Mountains. 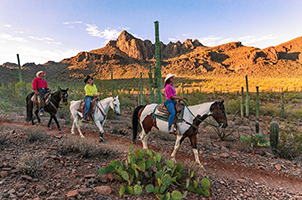 Riding, Rock Climbing, fat-tire biking, horse-back riding and shooting provide fun for the entire family on our 3,000 pristine acres adjacent to the Saguaro National Park. People can stay with us in one of our authentic western theme rooms. While they are enjoying their stay, we take them horse back riding, shooting, climbing, hiking and so much more. Our restaurant provides three meals a day for our overnight guests.